The suburb has actually been known by several different names – it was originally named Tumbalong by the Aboriginal people and when the First Fleet arrived it was known as Long Cove and then Cockle Bay. However, according to Visit Sydney Australia, its current name was settled in 1826 after the Governor at the time, Lieutenant-General Ralph Darling. You’re close to pretty much everything! One of the major benefits of living in Darling Harbour is its walking distance to the CBD, including Town Hall and Wynyard stations and the suburb of Pyrmont. So you have easy access to everything the city of Sydney has to offer without worrying about public transport. Plus some of Australia’s best universities such as the University of Sydney, University of Technology and University of New South Wales are easily accessible by train or bus from this inner city suburb. Thanks to its great location, there are always plenty of recreational activities to do in Darling Harbour. You can go shopping at the Harbourside Shopping Centre, view a range of marine life at the SEA LIFE Sydney Aquarium, explore the Australian National Maritime Museum and meander the winding paths in the Chinese Garden of Friendship. What better way to take a break from your studies? There are literally countless eateries scattered throughout Darling Harbour, from Hurricane’s Grill to Casa Ristorante Italiano. You can also easily walk to the nearby George Street and China Town to try out the cuisine there too. 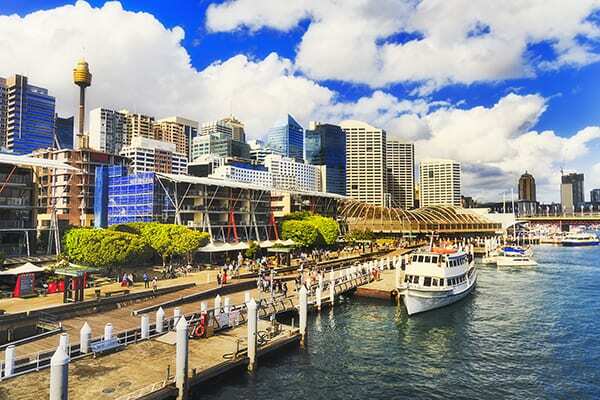 With Darling Harbour having so much to see and do, plenty of activities around the area and in close proximity to universities, eateries and public transport – what’s not to love?